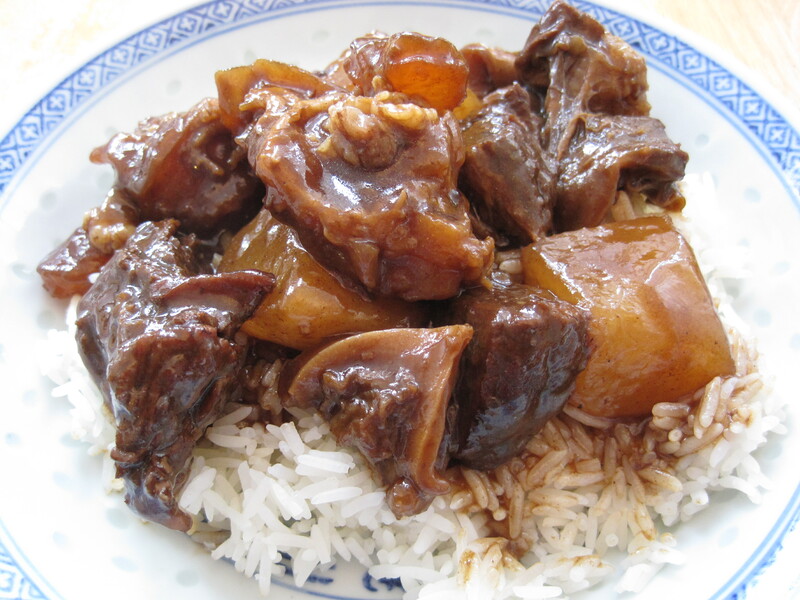 We love ordering braised beef brisket (nguw lam / ngow lam) from Cantonese (Chinese) restaurants and cafes. It is served over rice or noodles in soup. The best parts are the connective tissue and the tendons that get broken down and become soft and chewy. 🙂 Although it’s very easy to make, I had failed several times to recreate the restaurant flavour. Then I heard that the secret ingredient is chee hou sauce, so I bought a jar and tried again. It was exactly what I had been missing (other than MSG). The closest substitution that I can think of is hoisin sauce, but chee hou is more acidic, has more punch, and tastes more like fermented black beans. So, I don’t recommend substituting anything for chee hou. (See my curried braised beef brisket and tendons recipe here.) If you have leftover daikon radish, see here for a list of other recipes. Place the whole beef tendons in a medium sized pot of water and bring to a rolling boil over high heat. Then allow it to continue boiling for 20 to 25 minutes. This is a cleansing process so you will see scum and foam rise to the surface. Rinse the tendons well under cool water and chop crosswise into 3/4 inch thick pieces. Set aside. Heat a medium sized, heavy bottomed pot (I use an enamel coated cast iron pot) over medium high heat. Lightly coat the bottom with vegetable oil and brown the sides of the beef. You will need to do this in batches. Do not overcrowd the pot. Set the browned pieces aside. Turn the heat down to medium if the pot starts to burn and add more oil as necessary. When all of your pieces of beef have been browned, put them all back into the pot and add the ginger and garlic. Stir until fragrant, about 10 seconds, and deglaze with a large splash of shaoxing wine. Scrape up the bottom bits and allow the shaoxing wine to reduce for a minute or two. Add the chee hou sauce and stir well to combine. Then add the tendons, 2 cups of water, and the soy sauce, dark soy sauce, rock sugar, star anise, cinnamon, and white pepper. Most of the meat will be submersed in water. Cover with a lid and bring to a boil. Then reduce the heat to maintain a simmer, covered, for 1 hour. Stir occasionally and ensure that the tendons are completely submersed in the liquid. The rate at which your liquid evaporates will depend on the weight of your lid and the seal between your lid and pot. If your water is evaporating too quickly, add more water as necessary. If your liquid is not evaporating, simmer partially covered. After 1 hour of simmering, add the daikon radish and simmer for another hour, covered or partially covered depending on how much liquid you have left in the pot. At the end of 2 hours, you want 1/2 of the original liquid remaining if you’re only braising beef and radish. You want 3/4 of the original liquid remaining if you’re braising beef, tendons, and radish. It is better to have too much liquid than too little. The beef and tendons should be tender and chewy. The daikon radish should be soft and easily pierced by a sharp knife, but not mushy. Strain out the beef, tendons, and radish and set aside. Discard the ginger, star anise, and cinnamon stick. If you only have a small amount of liquid left in the pot, whisk together 1 tbsp of cornstarch in 1/4 cup of water and add this to the pot. If you have a lot of liquid left, ladle out 1/2 cup of the liquid into a small bowl and whisk in 2 tbsp cornstarch. Then add this back to the pot. Bring the sauce to a boil, stirring constantly, and simmer until you’ve achieved your desired consistency. Then add the beef, tendons, and radish back to the pot, mix well with the sauce, and remove from heat. Serve hot over rice or noodles in soup with hot sauce on the side. Add a little bit of water when reheating leftovers. This freezes well. As a taste tester for this recipe, I say you must try this recipe! Soo delicious!! YAY!!!!!! I’m so excited to try out this recipe! But where can i find that type of meat? Doesn’t seem like you can find it at the local grocery store. Hi Hayley! Thanks so much for your comment! I had to go to an Asian grocery store to find this cut of meat. I hope you can find it too! Can the Shaoxing Wine be substituted? say for instance – Japanese Sake? or other recommendations? You could substitute it with beef broth (or whatever broth you have on hand) or even water. THANKS for the sample of chee hou sauce! I made this the super duper lazy way – I slow-cooked this baby… (so sorry if that offends your hard work lol!) It turned out great though! I prolly left it in a little longer than i should have though cuz the beef got a bit piece-y once i started to stir in the cornstarch :S I also used beef broth as a substitute for the shaoxing wine as you suggested. My hubs loved it! Thanks again! I tried this recipe last Friday. Stick to the recipe very closely as I tend to deviate from it in the past. The beef turned out very good and tasty. However, the tendon was not quite done. It was still rubbery. Do I have to cook it ahead of time? It is still sitting in my fridge. I tempt to take the tendon out and slow cook it. Any idea? BTW, the tendon was bought frozen. I defrosted it and boiled it for 15 minutes before putting it with the beef. Any idea will be greatly appreciated. The freezing of tendon probably changed the texture slightly, but I don’t think it would make a huge difference after cooking… Maybe I chopped my pieces smaller than yours… Or maybe I had a stronger boil than you did… I will adjust the recipe to recommend a slightly longer pre-boiling time in case other people get the same result that you did. Thank you again for testing out my recipes! It is wonderful to get feedback! One more question, did you put the defrosted tendon into boiling water? Or did you put the tendon into a pot of cold water and bring it to boil at the same time? I did the latter which probably added a few more minutes of initial heating time. Also, I wonder if gently raising the heat versus shocking the tendon in boiling water makes a difference to the resultant texture of the tendon… might be an interesting experiment one day. I pre-wash the deforsted tendon. It was up to the room temperature. Then, I dropped them in a pot along with the beef, added in tap water. Gradually, I heat it up. I use a magnetic field electric stove top. It is a fast heating element. Would it heat it too fast and shock the tendon then? After all, I separate the tendon and cook for two more hours. They turned out alright but not “gelly” enough. Sounds like you did the same thing that I did. The only difference is that my tendon was fresh… I’m surprised that even two more hours wasn’t enough time to make it the right texture… In hind sight, I really should have taken a picture of the tendon while it was raw…. maybe we used different parts/types of tendon? This is one of my favourite dish and I’m actually going to attempt it for the first time today after eating at Chinese restaurants all over the world for so many years. I have also read a few other recipes which uses the chee hou sauce and I wonder if I can substitute that with oyster sauce instead. Will just have to see. Thank you so much for your comment! I used oyster sauce before I discovered chee hou sauce too. It will still taste great, but it won’t taste exactly like the restaurants’. Let me know what you think of it! Very great post. I simply stumbled upon your weblog and wished to say that I’ve truly loved surfing around your blog posts. After all I will be subscribing on your rss feed and I’m hoping you write again very soon! Hi Kat! I am SO happy to hear that you and your family loved this dish! Thank you so much for your comment 🙂 Have a great day! I’ve made this recipe several times now and the family loves it!! Thanks for the recipe. The only complaint (which isn’t your fault) is that the boneless beef rib I buy has too much fat (aka gunn) to it which the kids won’t eat. Will this recipe work with cheaper cuts of beef brisket that is very lean with no fat on it? Can I cook this in a slow cooker? Thank you for your comment! I’m so glad that your family likes it! This recipe would definitely work in a slow cooker! Also, I wouldn’t recommend using lean pieces of meat… the texture of the slow cooked meat wouldn’t be as appetizing and might turn out dry. But let me know if you try it! Thanks again! Thank you! I hope you try it! Hi Pauline! I’m sorry about the delayed response! Chee Hou sauce is a type of Chinese sauce. It’s completely different from anything else I’ve tried and I don’t use it in any other dishes, either. I get it bottled from Chinese grocery stores. I hope you find it! It makes a huge difference! Any suggestions on how to make this recipe in an Instant Pot? I would love to try it!